If you want to get away from it all and spend some time in a veritable palace worthy of the legend of the “1001 nights,” this is where to come. All the know-how of traditional Moroccan craftsmansship is represented in our two homes: hand-painted ceilings, stuccos, zelliges (small hand cut muti-coloured tiles), bejmatt (the finest floor tiles in the country) and magnificent wrought iron. 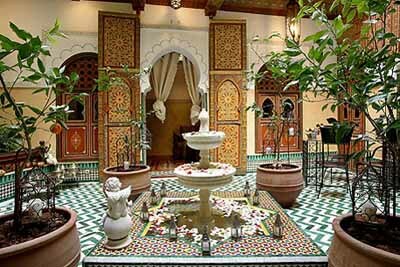 The setting, as in all traditional Moroccan dwellings, centres around the courtyard planted with orange trees and a central fountain. The riad offers you choice between 7 differently decorated rooms: 2 on the ground floor on both sides of the courtyard, and 4 on the first floor. Weather permitting, breakfasts and meals can be served on the terrace or in the open tower (one of the highest points in the medina), where you will enjoy a panoramic view over the médina, with in the backdrop, the snow-covered Atlas mountains until spring.